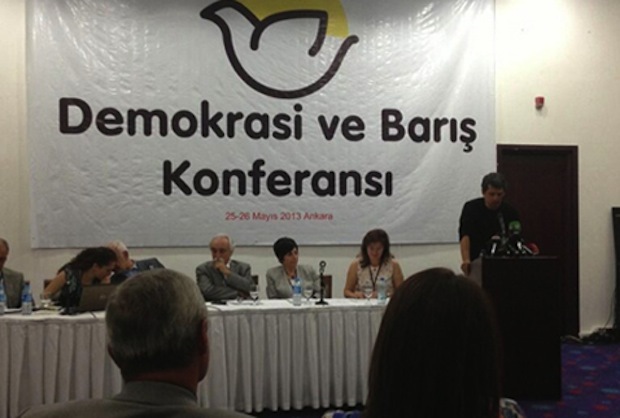 The Ankara Conference for Democracy and Peace, one of four being held across Kurdistan and the diaspora, took place 25-26 May 2013. The conferences are being organised as part of the ongoing peace process. ‘We Alewites, Armenians, Arameans, Kurds, Turks, Sunnis, Arabs, Roma – in other words all different peoples and religious groups, atheists, intellectuals, academics, young people, women, workers, unionists, political parties and groups have decided to work together. We want to create a sustainable peace and a democratic and just future, to develop a proposal for a viable solution to the conflict and create a collective peace movement. Those who have come together for this conference are aware that Turkey is in the midst of an important phase in the process of finding a solution to the conflict. We believe that is necessary to support this process and develop a solution to the Kurdish question. We declare that this conference intends to strongly and actively continue to support the negotiation process. We emphasise that it is crucial to create a pluralistic, just and free democracy to ensure sustainable peace. This democracy has to encompass all institutions. We repeat, it is imperative that democracy and peace go hand in hand and that democracy will advance the peace process. We observe that certain approaches prove problematic for the continuation of the peace and democratisation process in mutual trust. We stress that the AKP-government, with its hegemonic and authoritarian politics, should not create problems or prevent a successful progress toward finding a solution. We invite the government to take steps to build mutual trust in order to strengthen the solution finding process – trust building should not be one sided. We emphasise the need to ensure the health, security and freedom of Abdullah Öcalan – this will be crucial for the continuation of successful negotiations. Further, the means of communication between him and different societal groups needs to be guaranteed. At present, his means are very restricted. We stress the importance of a peaceful rather than a despiteful language, and of mutual understanding which is vital for the positive development of this process. To “socialise” the peace process and for future negotiations, we stress the importance of a peaceful environment. Democratic movements cannot be obstructed and freedom of opinion and assembly cannot be restricted. We demand a decree to release political prisoners, especially those who are ill and underage. We emphasise again that the universal rights of language, culture, religion and identity of people is not debatable. This right is a necessary requirement for equal citizenship. We believe that in each step of this democratisation process the equality of women and men needs to be guaranteed. Only then can a true and enduring peace be achieved. We, the participants of this conference, have committed ourselves to observing and monitoring the process of the peace negotiations. We emphasise need to never return to previous security policies, to not let the process come to a halt but to broaden its reach. We declare our determination to do all that is necessary to ensure this. Unanimously, we stress the necessity to investigate and deal with past crimes – the massacres, genocide, disappearances, victimhood – and that everything is done to expose all crimes against humanity and seek justice, without applying any legal limitation period. We call on all political parties in parliament, because we are convinced that a solution can only be found if it is inclusive. Our demands for the government and the opposition consist of reforming the law and speeding up democratisation. Further, the preparation of a new constitution should be finalised before the election, efforts to resolve the conflict need to be accelerated and the conduct and language in parliament needs to be improved appropriately. We draw attention to the fact that our goal in this joint struggle is not only to create peace in Turkey but also in the Middle East and Syria. The massacre in Reyhanli shows how urgent this matter is. As participants of this conference we announce that we will work together towards peace and democratisation to find a solution for the Kurdish question. We call upon all people and institutions who fight for peace, democracy and workers’ rights, who support the struggle for equality, justice and democracy in Turkey and are willing to participate in this struggle to find a solution together. We are open to different voices, opinions and natures and point out that we all need to start moving. During this conference, which brought together various groups, the will to find a solution, create peace and democracy has evolved. We are determined to continue our work in three different committees: the ‘Truth, Confrontation and Justice Commission’ the ‘Law, “Road-clearing” and New Constitution Commission’ and the ‘Collective Negotiation and Democratic Politics Commission’. Full of determination, we announce that we will all work together for the expansion and development of the collectivisation of peace and the negotiations, and for equality, freedom, the rights of workers, ecological justice and democracy. For this reason, and to create enduring peace, we see it as our main duty to organise the peace movement from below. Independent of all the problems we face, and of the policies the AKP will implement, it is our duty to strengthen the peace movement, to closely observe the negotiations and to support the Kurdish people. The approach of the ‘Commission of Wise People’, which is to only provide information for the government, is incompatible with the negotiation process. We see the need to share information with all parties and the population and point out that greater transparency is needed. We oppose intervention, occupation and massacres like the one in Reyhanli. We realise that our negotiations cannot be isolated from regional negotiations and the peace process in the Middle East. Peace can only be achieved if oppressed peoples are included. The view that the state sits at one end of the table and the Kurds at the other end is wrong. The joint observation of this conference is that the negotiations cannot be held only between the state and the Kurds but rather should take place between all oppressed peoples. Only then can a joint position among the oppressed be reached. It is in this phase that the peace process has to be carried by all of society. The societal pillars of the peace movement need to be expanded. The aspirations of all peoples of all nations, all languages, beliefs and cultures in Turkey and an end to armed confrontations of the Kurdish conflict need to be guaranteed and sealed with a democratic and enduring peace. Based on these realisations, it is imperative to coordinate our activities and take an even more active part in the peace process. To continue and further develop our tasks and steps, we have set up an internal commission. This commission will, according to the requests by all participants, organise talks with all parties involved in the event this process comes to a standstill. At the same time, as part of the aim of “socialising” peace, the commission will also organise regional conferences and similar activities.